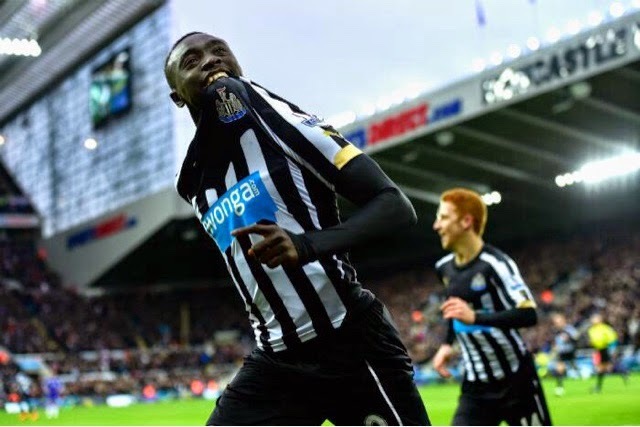 Newcastle end Chelsea's 14 game unbeaten run with Papiss Cisse the hero at the Toon. This game increases the unbeaten record of Newcastle versus Chelsea at the home of the Magpies. Firstly, Cisse opened the scoring when he crossed the ball in, Cahill miss kicked, Cissoko passed to Cisse, He prodded home, Predatory Striking right there, it was after half time for Newcastle. Cisse struck again, Colback got through the middle of the park untouched, slid the ball to the free Sissoko, on left, he should've scored, the ball was with Cisse, Courtois was out of his net, Cisse shoots into the unguarded goal. Taylor and Coloccini follow Drogba, he cuts in from the right, Before the striker could reach the Toons box, Taylor trips the Ivorian, the Newcastle man gets a second yellow and is off, this changed when Chelsea could go just a goal down. It did change, Chelsea were a goal down. The free kick, Fabregas took, 30 yards out, on the right, the ball is kciked into the middle. Alnwick comes off his line, it was too late, Drogba was the highest and struck in a header into the top left. The goal was not enough and Chelsea's run was ended, they were unbeaten until now, Newcastle defeat the 14 game win and draw streak of The South London side. Chelsea fail to win at Newcastle again! 228 days later, Chelsea have been defeated.